Large parts of the U.S. could experience a "potentially unprecedented flood season" through May as forecasts anticipate record levels of precipitation, according to a report released Thursday. 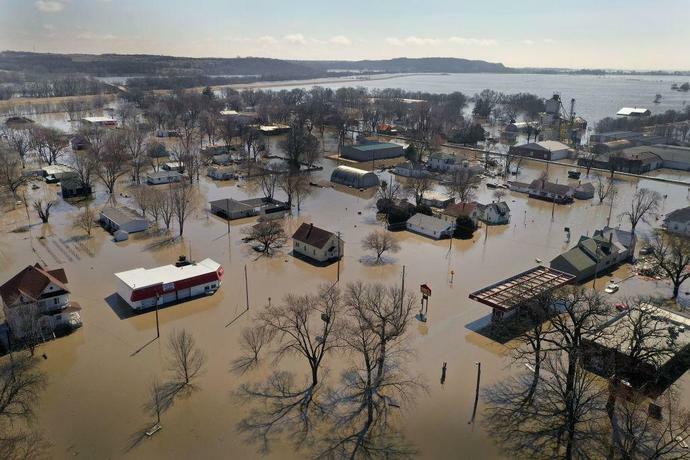 Much of the Midwest, including Nebraska, Minnesota and Iowa, has already be hit with historic flooding this year after the wettest winter in known history. Parts of Mississippi and the Red River of the North basin received rain and snow up to 200 percent above normal, according to NOAA's spring outlook. Last week, thousands were forced to evacuate their homes as a "bomb cyclone" storm prompted emergency declarations across Midwestern states. In Nebraska, heavy rain and snowmelt killed at least three and left two missing. Gov. Pete Ricketts called the weather event "the most devastating flooding we've probably ever had in our state's history." Officials say this deluge is "a preview" of the spring flood forecast, according to the Washington Post. "We expect the flooding to get worse and become more widespread," said Mary Erikson, deputy director of NOAA's National Weather Service, told the Post. "The stage is set for record flooding now through May." According to the NOAA's Climate Prediction Center, the April to June period will see above average precipitation in the majority of the country, increasing the flood risk, which could be further compounded by melting snow. Major or moderate flooding is forecast for 25 states. "The areas of greatest risk for moderate to major flooding include the upper, middle, and lower Mississippi River basins including the mainstem Mississippi River, Red River of the North, the Great Lakes, eastern Missouri River, lower Ohio, lower Cumberland, and Tennessee River basins," the outlook report says. Nearly two-thirds of the Lower 48 states are expected to be at "elevated" risk of flooding this spring. "[The flooding] could be worse than anything we have seen in recent years," Erikson said.